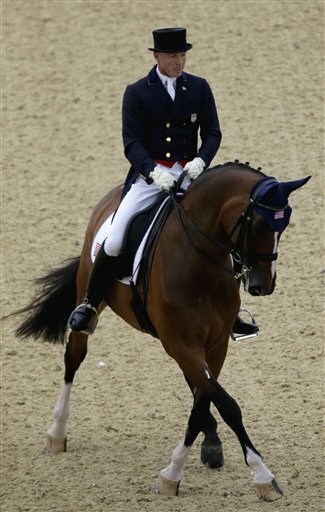 Jan Ebeling, of the United States, rides Rafalca in the equestrian dressage competition at the 2012 Summer Olympics. You know how like in baseball you have three strikes and you’re out, according to the Major League Baseball Association? Well in dressage, at the international level at which I compete, dressage is governed by the FEI and the Prix St. George Intermediare 1, Intermediare 2, and the Grand Prix. Dressage tests are segmented into a number of sequential blocks. Each block is scored between one and ten and marks are awarded for gaits, impulsion, the rider’s performance, and submission. Some segments are given increased weight by the use of a multiplier, or coefficient typically given a value of 2, which then doubles the marks given for that segment including Piaffe, Passage, Extended gaits, collected gaits (trot and canter), Flying changes (informally called "tempi"; one tempi or "oneseys"), two strides (two tempi), or three strides (three tempi). So it’s basically the same thing. Everyone picks on Ann’s hobby, but dressage saved her life. Yes, I cost $77,000 a year, but Ann said that riding me has helped combat the effects of her multiple sclerosis by providing “joy therapy.” I’m not just some pampered beast who costs $50,000 more than the nation’s per capita yearly income; I’m a joy therapist. So, if any of you are suffering from or a loved one is suffering from MS, buy a dressage horse. And, you’re welcome. Dressage saved my life . . . My sire, a Hanoverian jumping stallion named Argentinus, was dating an Indian mare named Dosha before he met my mom, Ratine, a dressage horse, who was introduced to my sire so that they’d breed a horse like, well, me! If not for dressage, my dad would have stayed with Dosha, I would have been born in India and drafted into the 61st Cavalry Regiment of The Indian Army, the only mounted horse regiment left on the planet. I’m a pacifist allergic to curry. Thank God for dressage!